Spring was pressing in, the air just on the very cusp of warmth, the day shining, the sky blue. In my office, the emails had been sent, phone calls made, and scriptures and commentaries reviewed for the upcoming sermon. I stared at my twitter feed, open and streaming. I looked at my email, still the same as it was five minutes before. I looked through the window of my office at the day, alive and bright. It was two hours until my next meeting. Two hours that I did not need to spend on a laptop, immersed in the dickering whirl of an unreal world. And so I closed the netbook, and left a little note on my office door, and out to my car I went. From there, it was ten minutes to the river, over the gorgeous country roads that surround the little burg of Poolesville. I tiptoed my Prius down the dirt road to the riverside, a road deeply furrowed and pitted from a long and rough winter. I finally reached the river's edge, and parked in a puddle-speckled lot by an open field. I took the few steps to the old canal towpath, slowed my breathing as I looked out across the Potomac, flowing fat from a rain-rich Spring. Life was just coming into the trees. In a few weeks, that path will be shadowed by a new canopy of delicate green. I set a timer to put a boundary on my meditation, and began to walk, trying to center myself to an easy pace and to my breathing. But my brain was a-scatter with thoughts, and the life and movement around me kept stirring me to stop and observe. The wind danced and rustled through the trees. In the abandoned canal, splashes came ahead of me as I walked, as turtle after turtle plunged from their logs to escape this meditative interloper. Some did not, and simply peered at me dispassionately from the warmth of their perches. To my left, two trees caught my eye. One, a sycamore, white as bone. Another, a--darned if I know. 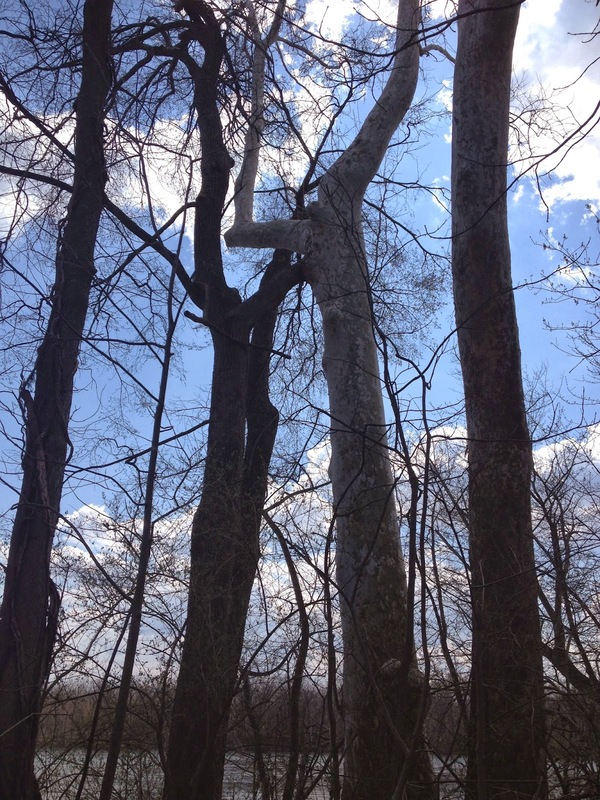 But the sycamore had grown around a large branch of another, and as I passed, it looked as if one tree was reaching into the heart of the other. I stopped and marveled at that, and took a mediocre picture. Still I walked, and I felt no more centered. Some days are like that, when the focused breathing and the walking and the repetition of an inner prayer are not enough to still my nattering ego-self. So I changed things up. As I walked, I sang. A little tentatively at first, because, well, we don't generally do that in public. But the path was empty in the middle of a weekday, and so I let my voice out a little. Then a little more. As I walked, I began with a version of the Lord's Prayer, a tune I alone sing, one I created years ago. From that, I sang old gospel hymns and songs, one after the other, as they came into my head. To the rhythm of my walking and my pace, I sang. I did this to the point where I turned back, and halfway on my return. When I stopped singing, I felt it, that blessed listening stillness of soul. The trees moved slowly in the wind, and the birds cried out, and the shadows of clouds raced ahead of me like children playing on the path. All of creation felt, in that moment, as you feel when your loved one comes in close. But they stop, lingering, their face just a hair's breadth from your own. You are not touching, not quite. But you feel their closeness, more deeply than you would if they just up and kissed you.